As the world prepares to join China in celebrating Spring Festival, nowhere will the dawning of the Year of the Pig (5 February) be more enthusiastically greeted than in Cardiff. 2019 marks the 30th anniversary of the unique ties which bind Cardiff and China. In 1989, the Welsh capital was the first city in the UK to twin with a Chinese counterpart when it partnered with Xiamen in Fujian province. Ten years on, Cardiff and Peking Universities began a collaboration across cancer research – a partnership that has since facilitated 91 scholar and 60 student exchanges and provided the basis for the founding of the Cardiff–Capital Medical University (CMU) Joint Centre for Biomedical Research in 2013. During that time, Cardiff has further expanded its partnerships outside Beijing, with 50 formal academic links and strategic partnership agreements with universities across the country. Industry has also played a key role, with Chinese biomedical service provider Realcan investing £1m in Cardiff research opportunities over a three year period from 2017 to ensure continued optimisation of biomedical and clinical research expertise. Recently, Chongqing Government officials visited Cardiff’s Institute for Compound Semiconductors to explore economic opportunities – their arrival closely following that of a delegation of more than 100 Chinese education leaders who spent three months in Cardiff developing their leadership skills and forging relationships with their UK counterparts. “This programme is a result of hard work on both sides, and is a symbol of the educational collaborations and the open era between our two great nations,” said Jianhui Xia, Education Section Counsellor of the Chinese Embassy in the UK. 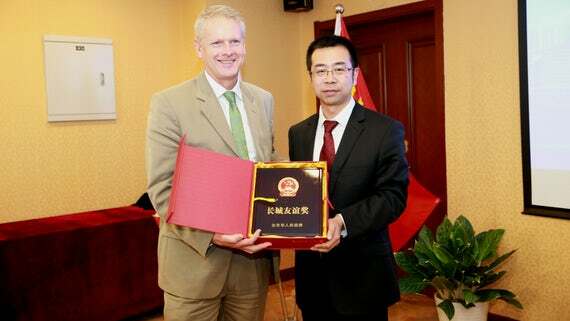 This expanding relationship was recognised when, in 2018, Cardiff’s Vice-Chancellor Professor Colin Riordan received the prestigious ‘Great Wall Friendship Award’ in recognition of Cardiff’s contribution to the development of the Chinese capital, Beijing. Cardiff alumni too are thriving amidst this golden age of Cardiff-China relations. From Professor Zhong Binglin (PhD 1994, Hon 2001), former President of Beijing Normal University and the Chinese Society of Education, and Professor Jiafu Ji (PhD 2015), President of the Peking University Cancer Hospital and winner of the Professional Achievement Award at the 2017 Study UK Awards, Chinese alumni are shaping the next generation of thinkers and problem solvers. This Chinese New Year offers an opportunity to reflect upon the shared achievement of the Cardiff-China relationship – and with such strong foundations to build upon, we look forward to another year of collaboration and innovation.